Create flow diagrams with Edraw Flow Diagram Software, which provides abundant flow diagram examples, templates, tutorials for free download! In the Information Age, efficient collection and analysis of information is critical for success. Flow diagrams offer a pictorial method of organizing and presenting data so that even highly detailed and complicated processes are easy to understand. This makes flow diagrams a great way to troubleshoot and improve processes, as well as an efficient way to disseminate information. Edraw flow diagram software (FDS) is a full toolset with auto arrange capabilities for you to generate a flow diagram effortlessly. Discover why Edraw is an awesome flow diagram software: Try it FREE. A top-notch flow diagram software which creates flow diagrams with minimum time loss for you. Support basic flow diagram, data flow diagram, process flow diagram, work flow diagram and process flow diagram. Powerful and easy-to-use drawing tools and many pre-drawn library objects, drawing does not need to start anew. Just drag the ready-made shapes from the toolbar and drop them on your page. Drawing couldn't be easier! What you see is what you get. Zooming, scrolling, multi selection and multi-level undo/redo supported. No artistic skill is required. Automatically align and arrange everything to make them look great. Lots of shapes and templates. Gallery support. It offers the template storehouse to collect, manage various kinds of works of excellence. 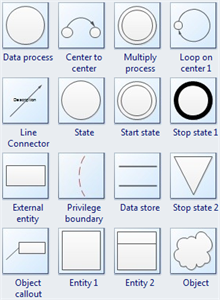 Edraw flow diagram software uses standard flow diagram symbols to represent different types of actions or steps. Lines and arrows show the sequence of the steps, and the relationships among them. Basic flow diagram has a beginning, multiple possible outcomes at some nodes, rules at some nodes, and possible multiple endings. The different symbols have different meanings. Arrows represent the direction of flow. Circles and ovals are starting, stopping, or control points. Rectangles and squares are steps at which processing takes place. Parallelograms represent input or output. With Edraw flow diagram software, it is also easy to design process flow diagrams. 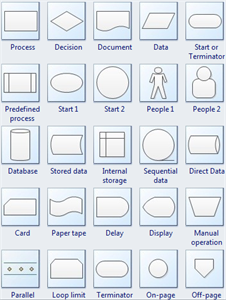 It offers more than 600 process flow diagram shapes in common use, so drawing does not need to start anew. 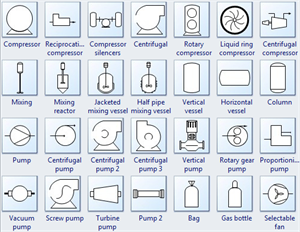 Flow diagram software is also available for data flow diagram and program flow diagram. Features include multi-page documents, external object import, as well as aligning, z-ordering, scaling and rotation. Various symbols are included as well as the ability to export to HTML, SVG, PNG, PowerPoint presentation, Word document, and PDF. Circulate the flow diagram to other people involved in the process to get their comments.